37 ¾ x 15¾ x 19 5/8 in. 37 ¾ x 15 ¾ x 19 5/8 in. 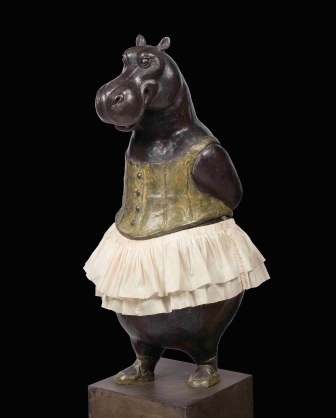 Carnival of the Animals is Danish sculptor Bjørn Okholm Skaarup’s first American museum exhibition, presenting a contemporary bestiary in bronze. Each of the twenty animal sculptures on view offers a whimsical story or allegory to decipher, inspired by ancient fables, art history, or modern animation. The title of the exhibition is derived from the suite Le carnaval des animaux by French composer Camille Saint-Saëns, who famously translates animal attributes into music. Okholm Skaarup instead interprets them in bronze. His Majestic Lion, traditional king of the animals, wears the crown and armor of a great monarch in the style of Medici court sculptor Giambologna, yet he sits astride a rocking horse, a reference to his fleeting and jovial power. A cheetah rides a scooter to move faster, a giraffe stands on stilts to reach higher, and a kangaroo bounces on a pogo stick—a “kængurustylte” in Danish. Okholm Skaarup’s diverse sources are at once light-hearted and highly researched. He recreates Laocoön and his Sons, the Hellenistic marble showing a Trojan family enveloped by gargantuan snakes, as a group of monkeys playing with a garden hose—a nod to the tradition of art “aping” art. 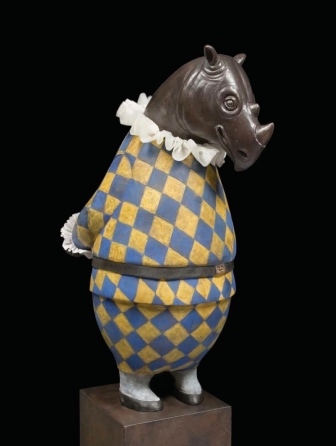 The Rhino Harlequin, clad in a yellow and blue diamond suit, awaits his tutu-ed Hippo Columbine, who at once evokes Edgar Degas’s La petite danseuse de quatorze ans and Walt Disney’s Fantasia. A Dancing Bear is patinated in vibrant Fabergé-like colors, dressed as the Ballets Russes star Vaslav Nijinsky, while a Dino Paleontologist discovers an unknown fossil in the sediment: the Flintstone’s Flintmobile. These indoor and outdoor sculptures display the vanishing art of large-scale bronze casting at its most versatile. They are at once accessible to young art enthusiasts, and rewarding to longtime students of art history. Click here for public programs that complement the exhibition. Click here for the press release and image sheet. Born in Rudkøbing, Denmark in 1973, Bjørn Okholm Skaarup was an artist at the Danish National Museum, Copenhagen from 1994-2004, before moving to Florence and receiving a PhD from the European University Institute in 2009. While in Florence, he studied the work of Renaissance sculptors Donatello, Cellini, and Giambologna. He also wrote and illustrated books on history, archaeology, and anatomy. In 2012, Okholm Skaarup was commissioned by the Koldinghus Museum, Kolding, a former Danish royal residence, to create four large reliefs depicting scenes from the life of Christian IV of Denmark. In 2015, the Collectivité of St. Barth acquired a suite of ten animal sculptures for public display throughout the island. 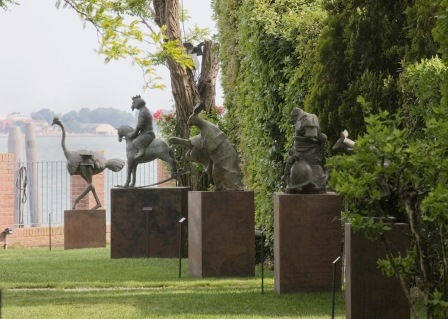 Okholm Skaarup’s sculptures have been exhibited at the Koldinghus Museum, Kolding; Museo del Cenacolo di Ognissanti, Florence; the Four Seasons Hotel, Florence; and Hotel Cipriani, Venice. Bjørn Okholm Skaarup lives and works in New York City. He is a member of the Royal British Society of Sculptors.